As much of a codger Alaskan Senator Ted Stevens is, he was right – the internet is a series of tubes. This was made impressively apparent when Google revealed pictures of its data centers. It looks like what heaven would be for the Blue Man Group. 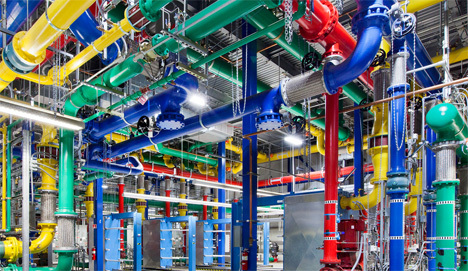 The images range from networks of massive tinker toy-looking pipes to the artificial twilight glow of rows of servers. Google photographed and released the set themselves. All eight of their data centers are included in the aptly-titled photo exhibit Where the Internet Lives. These magnificent shots are a documentation of Google’s well-known meticulous organizational traits, as well as a demonstration of the company’s unique design aesthetic. A network of ducts is arranged and represented by the colors in the Google logo. Long aisles of servers resemble the corridors from the Death Star. A collection of insulated pipes fit the style that would make any steam punk enthusiast drool. These rare images were taken by photographer Connie Zhou.